For the keen shopper, Clevedon has many very attractive specialist shops along Hill Road, Alexandra Road and a good mix of shops around The Triangle. 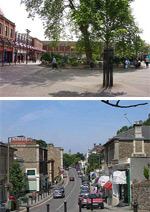 There are also many smaller local shops distributed throughout the town – Old Church Road, West End and Six Ways. Souvenir shops and tearooms can be found along Beach Road and in the Salthouse Fields area. Clevedon Court is one of the oldest manor houses in England dating from the 14th century. It was built by Sir John de Clevedon incorporating parts of a 13th century tower and great hall. This once fortified manor house has now been the home of the Elton Family since 1709.
collection and Elton Ware decorates the Clock Tower in the Triangle. Clevedon Court is now owned by the National Trust, it is open to the public on certain days of the week from Easter – end of September (Wednesday, Thursday and Sunday 2pm – 5pm). The Grade 1 listed Clevedon Pier dates from 1869 and was described by John Betjeman as the most beautiful pier in England. The Pier is open open everyday of the year except Christmas Day and in the summer stays open in the evening. A visit to The Pier has something for everyone - a stunning Visitor Centre with interpretative displays, an award winning cafe, a spectacular under-pier viewing window and a rolling programme of events. A small admission fee is charged as the Pier is entirely reliant on public support to fund maintenance costs of £100,000 per year. The tidal range at Clevedon is the second highest in the world, with a rise of over 47 feet from low water on Spring Tides. WARNING – strong tides. 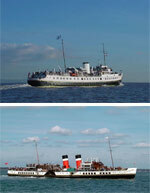 The Waverley is the last sea-going paddle steamer in the world, magnificently restored with towering funnels, timber decks, gleaming varnish and brass. See and hear the mighty engines – they will provide a whiff of nostalgia for some and are sure to impress all. The Balmoral is a beautifully maintained pleasure cruiser with restored period lounges and unrivalled access to the stunning scenery of some of the most picturesque parts of the UK’s coastline. Housed in a 17th century farm building, Clevedon Craft Centre is a must see for any visitor. Enjoy watching jewellery being made, leatherwork, painting and pottery or even feed the farm ducks, chicken and geese. The centre is a free all year round attraction with plenty to see and do. The many varied crafts provide an opportunity to purchase craftwork of the highest quality directly from the designer makers themselves. Open during the day from Tuesday to Saturday, and Sunday afternoons, the Craft Centre is located on Moor Lane, on the outskirts of Clevedon. Clevedon’s fine coastal walks offer stunning views which have inspired many great poets and writers including Tennyson, Thackeray and Coleridge. The popular coastal route that starts near Marine Lake and goes up into woodland before stretching out on the coast above with excellent sea views. 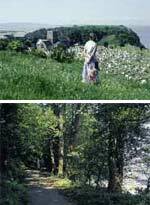 The walk with its views of the Bristol Channel and Wales is said to have inspired the poets. Taste the sea air with this walk along the coast. Stop at the many rock ‘balconies’ by the sea and rock pools. Surface: firm, narrow in places. Obstacles: caution – steep drops from the path and rocks. Parking: on-street parking in Bay Road, Clevedon. Climb through evergreen oak woods to discover caves and rocky outcrops. Paths loop round the contours and there is always something new to discover around the corner like the woodman’s cottage or the limestone seats. Surface: woodland paths. Obstacles: some step paths and gates. Parking: All Saints Lane, Clevedon or Hill Lane, Tickenham. These are situated at Alexandra Road, Herbert Road, Princes Road and Pier Copse off The Beach and opposite the Pier. Pier Copse also has a garden for the blind. Ladye Bay is a lovely, secluded cove much loved by visitors, approached by the coastal path beyond the Pier known as Lovers’ Walk, or by steps leading down from Bay Road. Clevedon’s playground where many residents and visitors come to relax. There’s a miniature railway, children’s playground, bouncy castle, crazy golf, tennis courts, and refreshment kiosk. Donkey rides are often available during the summer. Built in 1887 by William Green, the Bandstand was lit by gas and originally had no windshields, these were added later to protect bandsmen and improve acoustics. Listening to one of the many bands who play in the summer months brings a quality of a time long ago. Opened in 1912, Curzon cinema is the oldest, continuously operated cinema in the country, the original building had 200 seats. By the following year the building had been expanded to 389 seats, and was the first public building in the town to have electricity.The cinema was saved from closure in 1996 largely thanks to community support and is now run and owned by the Clevedon community.